The fun of Colette is irreverence. The independence of women was not a value as the 20 th century began. They lived within the parameters assigned to them – being wives, mothers, and support systems for their men in a world of total artifice for women. What outlets existed for women with creative ideas begging to get out of their heads? George Sand solved it by using an alias. Others dealt by publishing under their husbands’ names. In the 1890s, Colette (Keira Knightly) is married to Willie (Dominic West), a con man by instinct who is delighted with the collaboration he and his wife invent. She writes; he publishes her lighthearted work under his name. “The hand that holds the pen writes history” she says to her husband. She sees the truth and she is honest but in the long run, she will not be content to be a victim of a tough historical time for women. She becomes Colette, renowned French writer who gradually embraces the off-beat social scene of Paris. The books she writes are stories that fit perfectly in the existing world of total artifice. Light to the core, they are picked up by a world living in that prevailing culture, and Willie’s stream of stories – all by his wife – become celebrated. Why does he feel no guilt at taking credit for all her work? He’s perfect for the role – an uninhibited player in a culture that celebrates artifice. Writer/director Wash Westmoreland paints the whole thing with an appropriately light hand and never succumbs to the temptation to make everything come out right. Of Colette’s husband Willie, her mother tells her daughter “he’s a drunken, broken man,” and suggests she handle her writing and her life as she wants it to be. That includes an unappealing gay affair with an American and then a dandy one with Missy (Denise Gough) that is everlasting. Of her now nationally celebrated fictional character Claudine, the evolved Colette says “I’ve outgrown her.” She turns with great success to the music hall and the theater – moving now on her own talent without having to channel it through Willie. 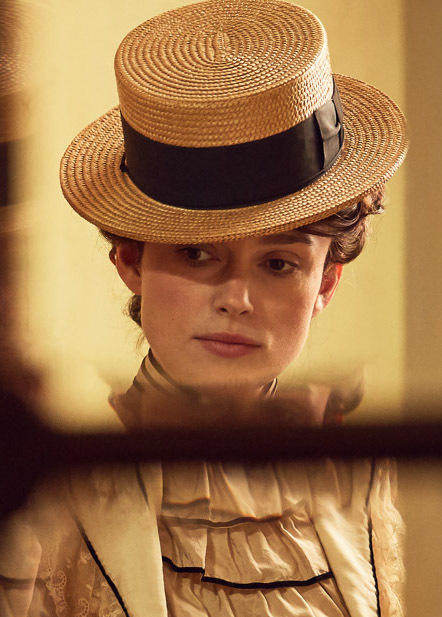 Keira Knightly does a fabulous job of creating Colette. From the lightweight writer whose Claudine has captured the French public, she evolves into resentment at her husband for taking the credit. The smart gal who has tired of creating Claudine switches to music hall and theater work while living with the woman she loves. That’s quite a series of life and mood changes and Knightly makes the whole trip credible and full of fun. She conveys Colette’s free spirit with abandon. Yes, she goes through a whole array of emotions but she isn’t trying to teach the audience any lessons and neither is writer/director Westmoreland. When we realize there will be no moralizing, we are free to float with the zany script that delivers Keira Knightly’s terrific bundle of talents. This is a fun one. This review was posted on October 14, 2018, in Biography, Drama, History/Biography. Bookmark the permalink.